bl.uk > Online Gallery Home	> Online exhibitions	> Asia, Pacific and Africa Collections	> Benares Ghat. 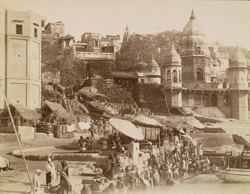 Photograph with a view of the ghats at Varanasi (Banaras) in Uttar Pradesh, taken by an unknown photographer in the 1880s, part of the Bellew Collection of Architectural Views. The sacred city (known to Hindus as Kashi) on the banks of the Ganges is the most holy of the seven sacred cities of Hinduism (the others being Ayodhya, Mathura, Hardwar, Kanchipuram, Ujjain and Dwarka), a place of pilgrimage and a key centre of Brahmanical learning. Its waterfront is lined with the stepped embankments called ghats where thousands of pilgrims come to perform ritual ablutions, and where the bodies of Hindus are cremated.